This two-story cottage features a narrow footprint and a charming portico entry. The dining room showcases a curved wall of windows and is defined by columns. The kitchen is open to the breakfast nook and the great room steps out to a screened porch. A sitting room enhances the master suite while an octagonal tray ceiling brings elegance to the master bathroom. 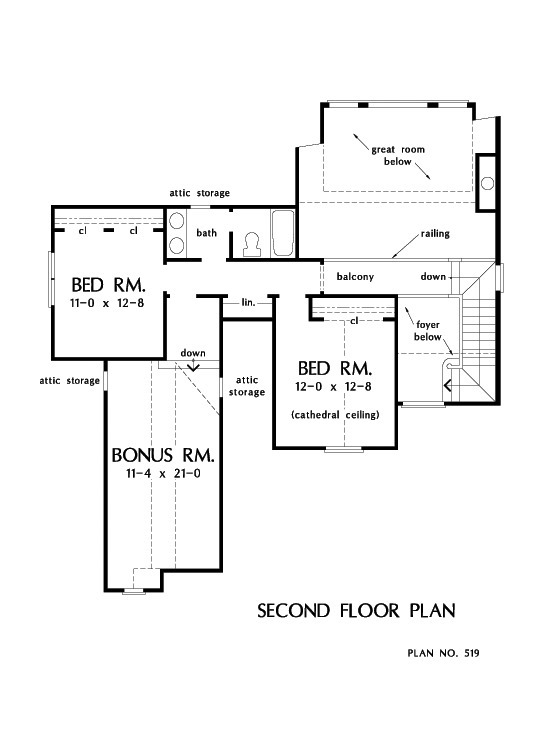 Two bedrooms are upstairs with a full bathroom and a bonus room. 1st Floor: 1593 Sq. Ft.
2nd Floor: 575 Sq. Ft. Bonus Room: 303 Sq. Ft.
House Dimensions: 45' 4" x 64' 8"
Great Room: 19' 10" x 15' 2"
Storage (Other) : 5' 2" x 6' 4" x 0' 0"
Other : 2' 6" x 8' 6" x 9' 0"
Foyer : 6' 2" x 10' 6" x 9' 0"
Dining Room (Tray): 12' 0" x 12' 4" x 9' 10"
Great Room (Cathedral): 19' 10" x 15' 2" x 19' 0"
Breakfast Room : 11' 0" x 12' 8" x 9' 0"
Utility Room : 11' 2" x 6' 0" x 9' 0"
Bonus Room (Vaulted): 11' 4" x 21' 0" x 9' 4"
Garage : 22' 0" x 21' 0" x 0' 0"
Garage Storage : 16' 0" x 2' 0" x 0' 0"
Master Bedroom (Tray): 13' 0" x 15' 0" x 11' 0"
Bedroom #2 (Cathedral): 12' 0" x 12' 8" x 12' 8"
Bedroom #3 : 11' 0" x 12' 8" x 8' 0"
Porch - Front : 22' 8" x 4' 8" x 0' 0"
Porch - Screen : 20' 4" x 9' 4" x 0' 0"
Balcony : 12' 10" x 3' 8" x 8' 0"